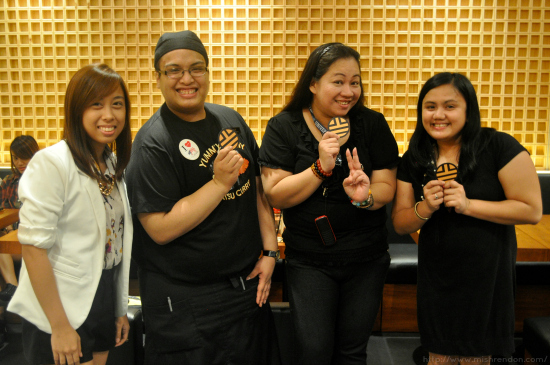 LBD & ONESIES - A Lifestyle Blog: Yabu: House of Katsu is now open at SM North EDSA! 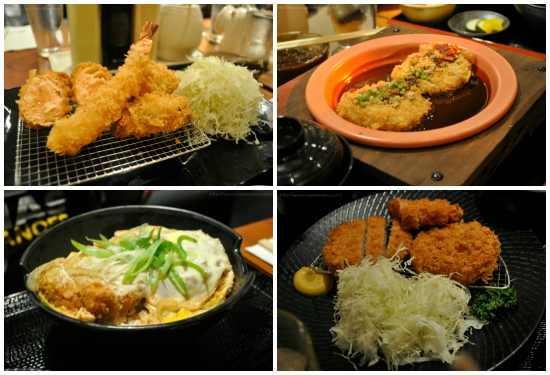 Yabu: House of Katsu is now open at SM North EDSA! 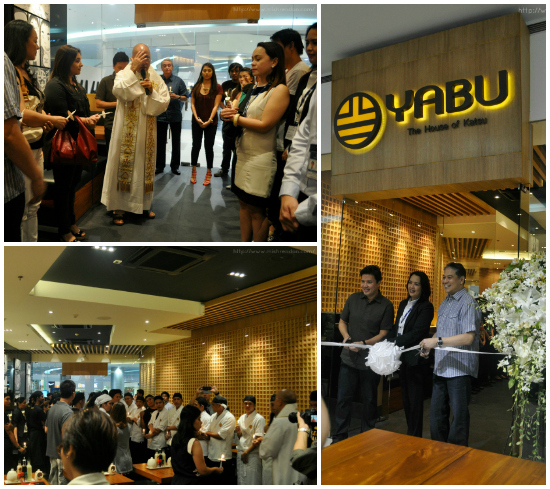 Last week (despite my crazy midterms schedule), I attended the inauguration of Yabu: House of Katsu's 6th and latest branch at the SM North EDSA. They've been around for probably a year or two, but they are already very popular among people. Have you seen the photos from their opening? People went crazy! As for regular days, lunch and dinner times are usually very busy. 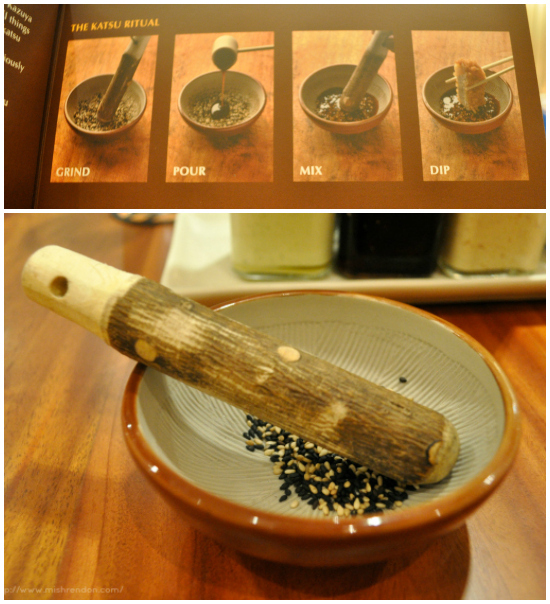 Yabu was actually introduced to me by a friend who loves their food. 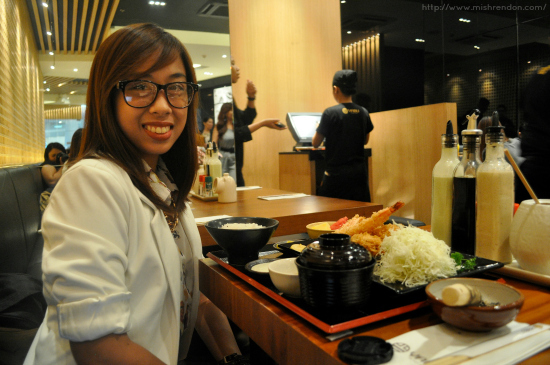 Since then, I cannot resist Yabu! 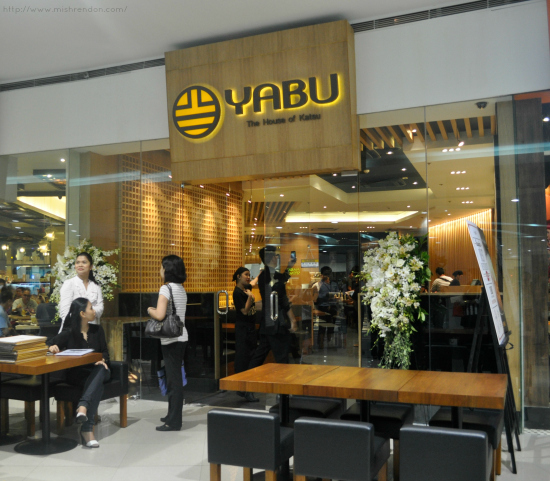 I believe Yabu at SM North is the largest one among all the branches. This one's located at the 2nd floor of The Block. It may be very spacious but it gets packed all the time! 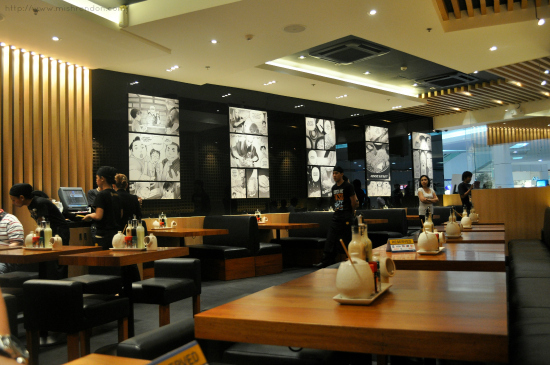 The interior of Yabu is well thought of. 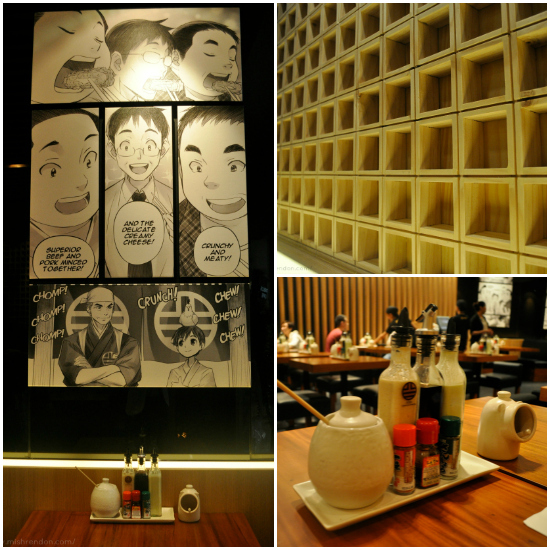 To boost the Japanese vibe, entertaining manga panels are placed in the walls. Also, sake cups are intricately located in a wall of their branch. There are probably thousands of cups in there! Time to eat! I endlessly browsed their menu before I ended up with Mixed Seafood Set 2 for my meal. There were so many good dishes to try so I had a hard time deciding. 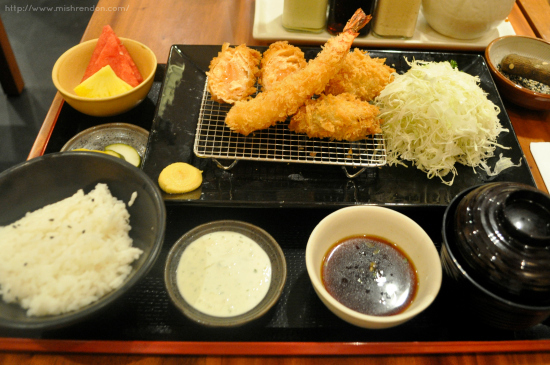 The Mixed Seafood Set 2 is a katsu set meal which has a Black Prawn Tiger, Salmon, Hiroshima Jumbo Oyster, and Creamy Crab. Along with it is unlimited rice and cabbage, miso soup, Japanese pickles, and a bowl of fruit. Believe me, this dish is just enough! I didn't even get to ask for extra rice (I usually do. :p) cause I was already full. What I love the most from the set is the huge Oyster. I am not really a fan of oysters. But cooked the katsu way, this one tasted amazing. The rest of the items from the set are also great, especially the salmon. :) I love the cabbage too with the sesame dressing. Good thing it is unlimited! These are what my seatmates had. Ross had the same dish with me. Ria, on the other hand, had the Miso Katsu meal (upper right) which looks very appetizing. Cha had the Hire Tonkatsu Set (lower right), while FPJ had the Original Katsudon Set (lower left). Of course, we won't miss desert! We had the Choco Lava Cake. 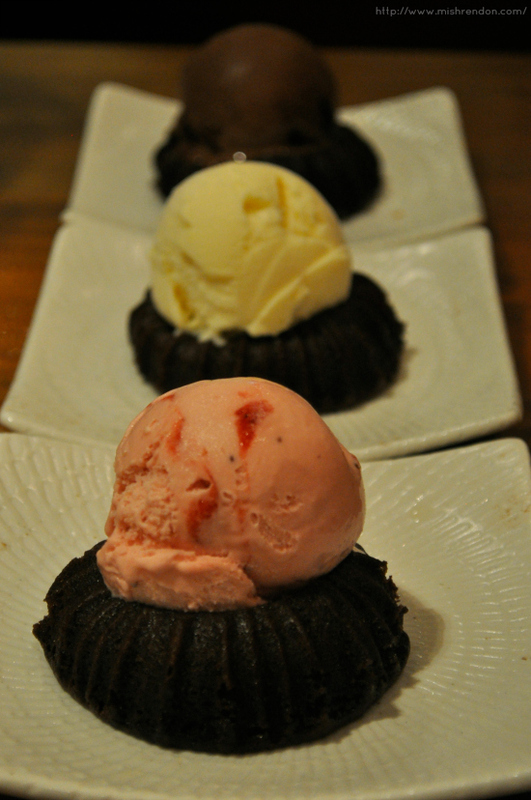 This comes with Vanilla, Chocolate, and Strawberry ice cream. I would say that Strawberry and Vanilla are the better choices cause it balances the sweetness of the cake. 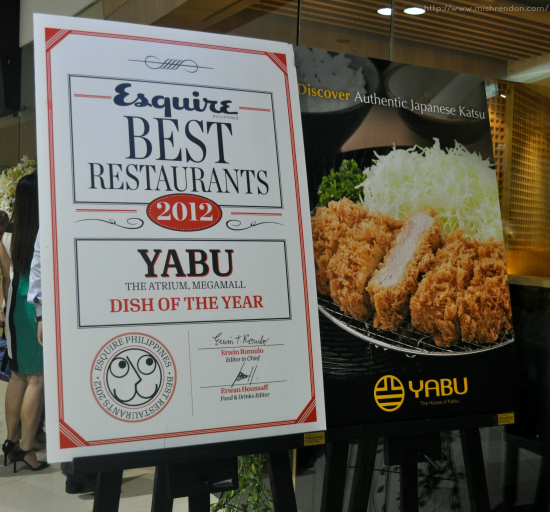 Congratulations on your success, Yabu! You deserve it!